When you have little dogs it can be a worry as the nights start drawing in. Sometimes I find it hard to keep an eye on Indigo and Mouse outside in the dark, and I want to know they’re safe. When the people at Qwerkity sent me this LED safety necklace, I couldn’t wait to give it a try. 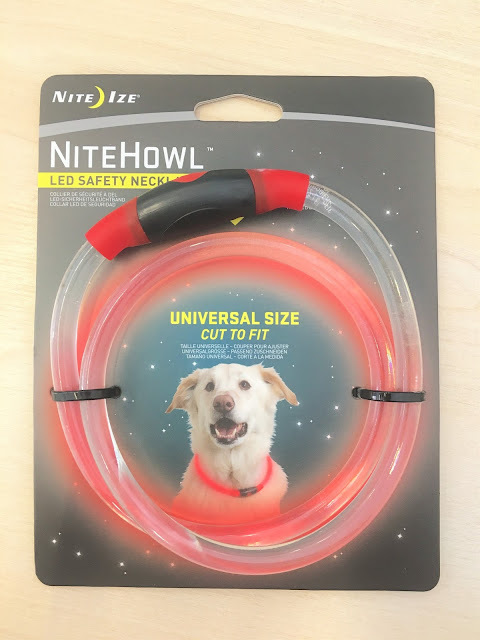 It comes in one size, which is adjustable from twelve to twenty seven inches, making it great for big dogs too. I decided to try this out on Indigo as it’s too big for Molly, but would probably fit most small dogs. It can be set to glow or flash by pressing the button once or twice, and it has a massive sixty hours of battery life. Indigo wears this for night time pee pee’s, so I can see where she is at all times. I’ll be looking for a smaller one for Molly, so I can keep an eye on them both. I love that at the push of a button you can clearly see your dog in the dark. *If you think this looks like a good idea you can get yours for £9.99 from Qwerkity by clicking here.